Ko-fi - The Richards’ Swamp - Ko-fi ❤️ Where creators get paid by fans, with a 'Buy Me a Coffee' button. Down at the end of Richards’ Road, where it ran into a dirt thing that was still called The Track, even if it didn’t show up on any maps except the locals ones, there was a swamp. It wasn’t one of those eventual swamps, where the edge of a lake or a river sort of trickles into dampness like a basement in spring. No, it was a perpetual swamp, with pockets of water so deep you could lose a deer up to its antlers in a heartbeat. The swamp was never quiet. In the daytime, it rustled and whispered and shook, even when there was no breeze to be had. In the moonlight, it sang. The people who lived on Richards’ and on the Track didn’t go into the swamp, not in the day, not at night. Except sometimes, sometimes the call was too loud. Someone would start to go wandering at night, especially on those full-moon nights when you could almost convince yourself that it was safe. Someone would start to linger at the edge of the swamp, just taking a couple steps in. There was good hunting in there. Everyone knew it. In the moonlight, the deer’s eyes glinted at you like a challenge, like a summons to battle. If those who started to wander were lucky, their families would catch them, would sit on them, would take them out of town for a while or just lock them in a basement until the fever passed. If they were lucky, someone noticed before there was nothing to be done but put another cross at the side of the road. Those strangers who drove down to the end of Richards’ Road in the moonlight, they never had a chance. Their car would slow, would stop. They’d get out, and the lights would call to them. A path would open up, a hand would reach out, and they would hurry forward, seeing a house with a phone, seeing rescue. In the morning, someone would tow the car off to the junkyard. There was no point in looking, no point in risking more lives. If the car was empty, the stranger who had gone in the wrong direction was gone. 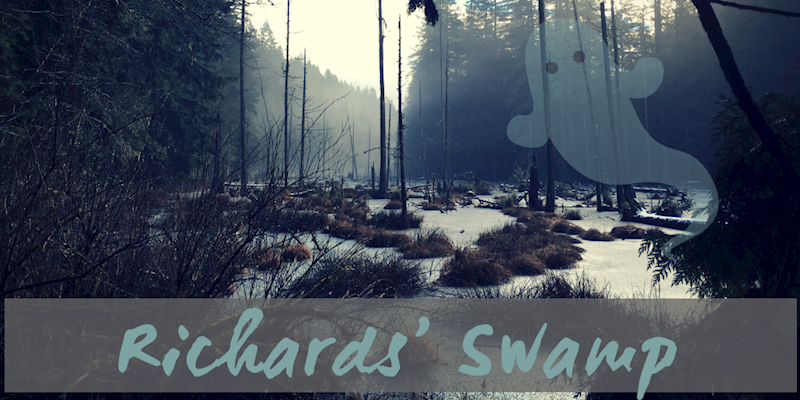 And deep, deep in Richards’ Swamp, the shadow of three sat in the driest spot, watching as another body sank to the bottom of their lair. They watched as, one more time, the body landed and no spirit slipped out. They were lonely, with nobody but each other for company. But over and over again they called, and over and over again, the land-dwellers brought them only bodies without spirits. The moon was nearly full, and the three reached out again. Maybe this time, they would find company.